The problem of additional ventilation, which occurs normally during the installation of modern window constructions into the old buildings, remains relevant. To solve this problem there have been developed additional ventilation systems for window structures. The systems provide the air flow, which is necessary to avoid increased humidity and mold growth. Depending on the technical solution there varies the amount of inlet air and the possibility of use in view of the height of the building. The main objectives of the development of ventilation systems were the possibility of further equipage of plastic window elements, noise reduction, the implementation of optically the least significant solutions and the desire to avoid cutting holes in the profiles, what makes a return to the original state impossible. 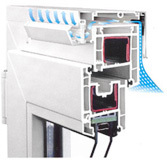 It is better to order ventilation system simultaneously with making an order for the window, as many systems (such as REHAU Climamat) are mounted on the window element. However, there are systems that can be mounted on the installed windows (REHAU Aircomfort). DUCO offers such variant. In this case the double-pane unit is replaced by the one which is of lower height, and when the ventilation system is inserted to the top. Vent valve REHAU-Climamat should be installed on the window element. In addition to that the valve allows to regulate the flow of air step by step. The valve allows avoiding of high humidity and provides with an optimal indoor climate. It is provided with air filtration from dust and pollen. Fully automatically and therewith completely noiselessly plastic membrane blows sand in caser of normal power of wind and blocks its way in case of strong wind or hurricane in order to avoid huge heat losses. By reducing the outside air pressure the membrane again starts to blow. By means of the control valve, located within the inside, you can open and close the air channel. The valve directs the air flow so that it flows upward, reducing the possibility of a draft. The filter from dust and pollen is installed on the air channel. The filter can be easily removed and cleaned. AirComfort – a hidden ventilation system of a new type. Provides with fresh air from the windows, depending on the wind pressure. Mechanism that works without electricity is sensitive to high wind pressure and closes automatically. As a result air humidity reduces, and herewith still satisfy the requirements of the regulations for energy efficiency. For residents there is created a healthier, more favorable climate, and building owners get extra protection of their property from the cost reduction caused by the damage of the building from humidity due to improper ventilation. Due to easy installation, which requires no screws and holes, this flexible system is economical: if necessary, it can be additionally equipped with window structure. It is suitable for both new facilities and renovation of old buildings. 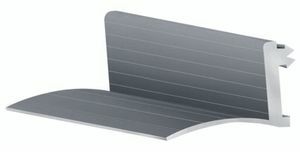 Aluminum ventilation panels for natural positive pressure ventilation are installed in the upper part of the window. The housing can be painted in any RAL color. There is heat insulation, in the winter it does not freeze. It can be easily mounted to the window. 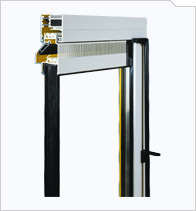 Can be used to install on the windows from PVC, wood or aluminum. The size of double-pane unit decreases with height. Installed on the double-pane units 20, 24, 28 and 32mm. There is flat valve inside – valve, which is easily controlled with a cord or rod.. Installed on the double-pane unit 24 mm. The size of double-pane unit reduces for 80mm. Inside there is a drum-type valve, which is easily controlled with a cord or rod.